I love homemade jars of Christmas joy. Each every one that we receive during the holidays makes me feel warm and tingly because I know the effort and thought that it takes to pour that much love into jars to share with those you love. I suggest you pickle something and give it as gifts instead of running out at the last minute and buying a token gift. 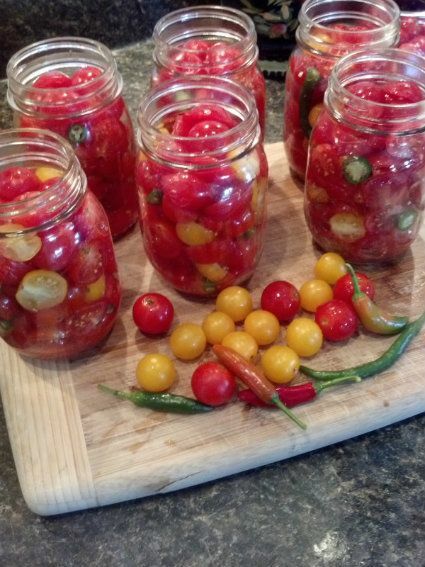 Today I am working on pickled cherry tomatoes. They are soooo good!! How nice it is to have tomatoes on hand for beautiful salads when the snow is flying and the icy conditions keep us indoors. They also make wonderful garnishes for cocktails. Fill jars with boiling vinegar mixture. Apply lids and rings. Process in a water bath for 15 minutes. HomeGrown Christmas Day 10 – Pickle Something Edition! These look awesome honey !!!! I have never had a pickled cherry tomato , what is the texture like ? presentatioon topic, which i am going to convey in academy. do I really stuff 12 oz into 8oz jars it the other way around? can you elaborate on the “process in a water bath” first timer here and in confused at to what that means.